Rob (left), Al (right) in the garden at Matai st, 1991. Here's a couple of tunes knocked out by myself and my old buddy Al. I jammed with Al quite a bit during the 90's. We also had a band for a while which we didn't really have a name for. That band consisted of me and Al on guitars, me on vox and a drum machine. We played a few gigs here and there (mostly supporting the black panthers i think) but sadly there's no actual recordings made of that project. I thought i had a live set in the tapebox somewhere but as yet i ain't come across it. Al was also the secret 5th member of the black panthers and played keyboards on a couple of tunes during live performances. Namely on our cover of Deep purples 'child in time'. Ha. That was so much fun to play. Especially with Matt and Vaughn trying to reach those outrageously high vocal notes. Again sadly, no recording of that exists that i know of. But then, as my grandmother used to say: 'What you never see, you never miss'. I think she was bang on the nail with that one. Now that Al is no longer with us i value any recordings that we made together that much more. Hope you can find some value in it too. 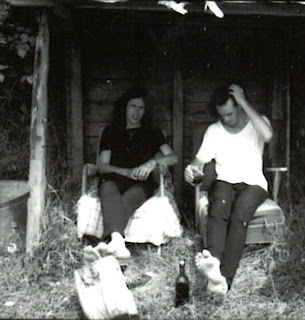 Photo is of me and Al in the yard at Matai st. With a glass of homemade plonk i believe. There's two tunes here...... enjoy.